I have a simple card to share today . . .
a few pretty pansies layered on a woodgrain textured background. 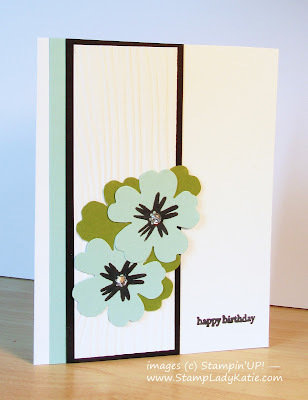 This is a very simple lay-out for a card - an accent strip down the left side and the focal point slightly below center. 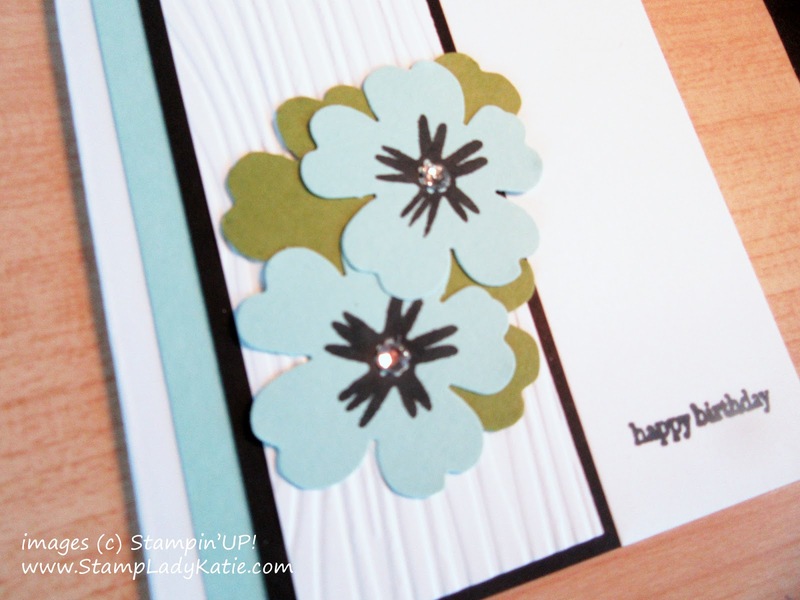 The thing that makes this card really "pop" is all the layers and texture. I hope it shows through well enough in the photo, can you see the woodgrain texture embossing on the white piece below the flowers? Its so funny, before Stampin'UP! decided to sell the Big Shot I never embossed anything and when they introduced the Big Shot machine into the product line I really balked at spending the money on such a pricey tool that I thought I'd never use. Now I use it all the time - both for embossing and for die-cutting. Speaking of die-cutting, the flowers on this card are not die cut, I used the Pansy Punch. And here's a little trick to share - the leaves are also the pansy punch. I punched a couple of green flowers and cut them into pieces to layer behind the blue flowers. Its an easy way to get double duty from a punch. Here's the list of supplies used on this card.